When we were children, monsters were tangible. They watched at night in the window with bloodshot eyes. They waited to sneak out from under our beds. But beneath the warm covers, we had one belief that allowed sleep. No matter how fierce the monster was, our oh-so-average parents could make them go away. It didn’t matter if they were 10 feet tall or had razors for teeth or could snap us in the grasp of one hand. With the crack of the door and the sound of heavy footprints, they would retreat to wherever they came from. It’s not so easy when we become adults. Our monsters aren’t as tangible, but they are as real. They linger deep within. The hard part is knowing that there isn’t another human on the earth that can make them go away. There are many that can give light and take us to higher places, but the final decision to face them has to be our own. When we are stuck with ourselves to remedy the situation, I think we wonder if we are ready to be the hero of our own story. Recently, as many of you who follow on social media know, my sister-in-law has had to start an aggressive chemotherapy treatment for a strange lung cancer. I don’t know if she realizes it, but she’s become a hero for those of us who know her. Quiet and brave, she keeps battling the unknown with amazing strength. If it had been suddenly, it wouldn’t have been less impressive, but she’s been on this journey for over a year and a half. Because she has been battling this disease for awhile, I’ve often wondered if I would be brave enough to shave my head if she had to lose her hair. Hair is a funny thing. It’s essential and not all at the same time. I’ve heard that losing hair is the first worry women have when they learn they need chemotherapy. As I’ve sat in groups of women, the topic invariably goes to nails, hair, and the shape we are in. If I said I didn’t worry about those things I would be lying. My long wavy hair wasn’t only my identity; it hid bad makeup days and the moles on the back of my neck. It made me feel feminine and free-spirited. When I thought about shaving my head, I became shaky. I didn’t think I could do it. I thought about how many weird haircuts I would have to go through and the years it would take to get my long hair back. I thought of all the trouble it would be to switch my pictures on my website and how I would have to “warn” new clients about my bald head so they didn’t think they had hired a crazy rebel. I thought about how it would be uncomfortable going to church. I thought of all the attention it would create, something an introvert like myself does not like. Then I realized something: all of my rationalization were about the opinions and actions of others. I was coming face to face with an internal monster. I wish I could say that shaving my head was a completely unselfish act for my sister-in-law. It’s not that simple nor am I that holy. In my heart of hearts, I knew it would mean a lot if another woman walked that path with her. I wanted her to feel my love and support. But I also thought of myself. I saw myself years down the road. I thought of my own regrets. I knew that my future self would feel more pain for caring about the opinions of strangers than walking beside her for awhile with no hair, as scary as that seemed. I think it has been one of the most sacred experiences of my life. It hasn’t cured me of worrying about what others think. I still wear head wraps to hide my head if I’m going somewhere public. When I choose not to wear a wrap, it makes me wince when I get stares or when strangers quickly look away. I don’t like how masculine it makes me feel. At the same time, I’m completely at peace. After all, isn’t feeling all of these things the point? As it always goes, once I confronted my monster, it slipped into the shadows. More people have shared personal stories and kind words than I could ever imagine. 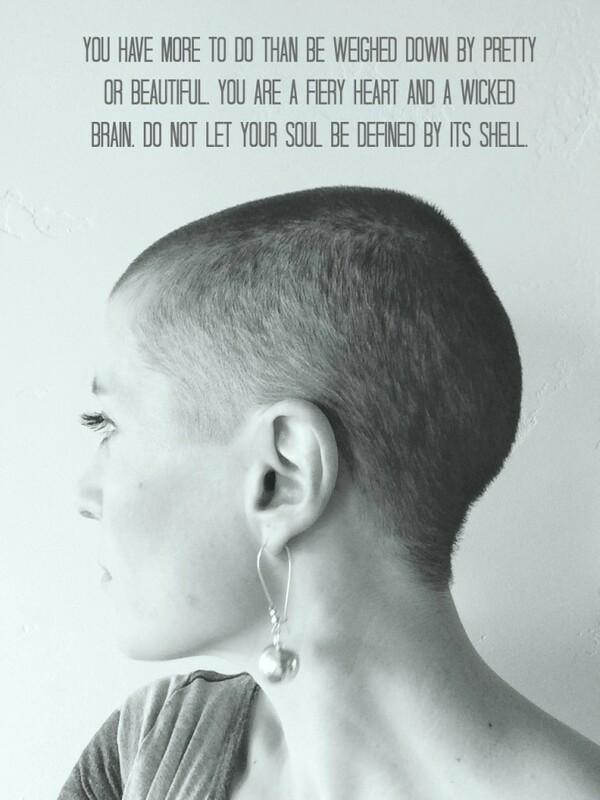 Many women have told me they’ve wondered if they would be brave enough to shave their heads. I tell them they would. Maybe today you aren’t worried about something as trivial as your hair, but I bet there’s something scary you are facing. Let me tell you with no small conviction that you have everything you need to defeat your own monster. Believe that you can. P.S. We have set up a fund for my sister-in-law. If you would like to donate, click this link. Thank you Tawna for sharing this. I think you heard that I cried the whole time Danny was shaving my head. I was crying for all the wrong scary reasons….why do we have to care so much about what others think! I do…I didn’t want to be ugly. I didn’t want the attention. I didn’t want all the stares. I mostly didn’t want to scare my nieces and nephews. I wasn’t worried so much about the Allred side but the Barnes side they are little and don’t understand really. Tawna I want to tell you now it helped. It feels good to have two other women that I know and revere support me in a challenging way like you and mom did. Thank you and I love you.